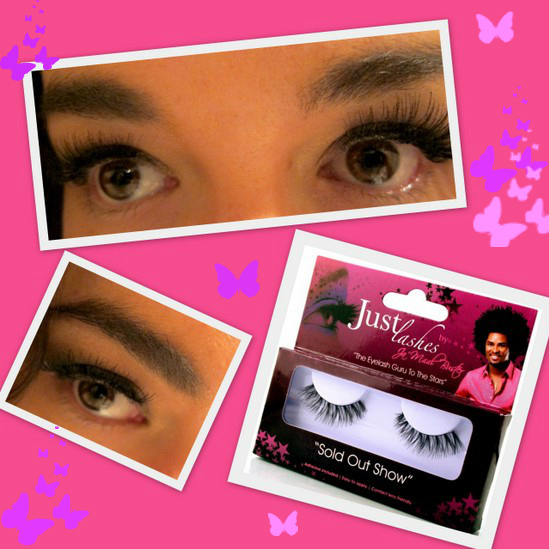 Fluttery lashes courtesy of 'Sold Out Show' Just Lashes by Ja'Maal Buster! I've only worn false eyelashes a handful of times in my life, and on each occasion they've been applied by a professional. I'm always amazed by the difference they make and have resolved to experiment with them myself for big nights out. So I was both excited and a little bit apprehensive to be sent a few pairs of Just Lashes by Ja’Maal Buster, just in time to try out for my Christmas party. If you haven't heard of Ja’Maal Buster, he's known as 'the eyelash guru to the stars': when he opened his salon in Dallas, Texas, it was the first dedicated to lash artistry in America and is still, according to Vogue USA, the "country’s best lash salon". He works regularly with Rihanna, and Beyonce reportedly loves his lashes so much that they're the only ones she'll wear. His falsie line is available in five styles with each one retailing at a reasonable €6.95. I say reasonable because they're high quality and can be reused several times -- although not with the glue supplied. The tube comes with a snap-off lid instead of a twisty, reusable applicator and so, despite it being a brilliant product and there being more than enough provided for several applications, I had to bin mine immediately after the first use. That wee niggle aside, I got on great with these. I wore Sold Out Show to my Christmas party -- this set has fine, fanned out hairs and gives a really dramatic look that at the same time, somehow manages to look quite natural. I stuck them on at my desk and despite being a total klutz and a complete beginner, I managed to get 'em on at my first go. They were comfortable to wear, lasted the night (through rain and gale force winds!) and I absolutely loved the way they looked. I didn't want to take them off! Just Lashes by Ja’Maal Buster are €6.95 and available from Sam McCauleys, selected chemists and salons countrywide and at www.jamaalbuster.co.uk. I highly recommend! Edit: Irish online store Beauty Emporium are currently selling these lashes at just €5 per set, so make sure you check them out! Thanks Sarah! I was delighted with how easy they were to apply -- will definitely be wearing them over Christmas and New Year! I bet these looked fab on you - I am useless with these things but would love to wear a pair of dramatic ones to a party even once. They look gorgeous on ya! I've used them a few times and was able to use the glue supplied several times. My only thing was that the glue was difficult to get off - it didn't come off with eye make-up remover. Any suggestions? Thanks Lucky -- that's good to hear about the glue. I'll try and hang on to it the next time. I didn't have any trouble removing it, I just pulled off the lashes and took my makeup off in the usual way...sorry that's not much help!